5 Leadership Lessons from Captain James T. Kirk … is the title of a Forbes Blog Post written by Alex Knapp. Now I have always loved the old school Star Trek episodes with Kirk at the helm – except for the “Trouble with Tribbles” show. And James T. Kirk certainly had a distinctive leadership style. Here are the 5 lessons Mr. Knapp pulls out of his Kirk recollections. Kirk never ceased to amaze us with his encyclopedic knowledge of technology over the ages. I remember one episode where he fashioned a cannon out of bamboo and made gunpowder from scratch … not bad for a boy raised in the age of Phasers. What do you do to stay fresh, interested and always be learning? Where are your growing edges? Let’s face it, you couldn’t keep the captain on the ship. He always wanted to be where the action was … in the front line. And how often do we see leaders retreating to their offices and losing all touch with what is going on at the point of contact with your clients? Kirk wouldn’t stand for it … he was the original “management by walking around” kinda guy. Where is your “Away Team” and when was the last time you hung out with them? Chess is about tightly defined rules. It is about exactly what you can and cannot do. Life is a game of probabilities and Strategy that resembles Poker more closely. Life and business sometimes involve a straight bluff – a technique Kirk used a number of times to outwit his rivals and opponents. What is your life/career strategy and where can you use more creativity … rather that feeling stuck inside rigid rules of what you “can and cannot do”? Kirk’s first (and perhaps only) love was the Enterprise. Yet, in Star Trek III: The Search For Spock – when the life of the crew depended on it, he sacrificed the ship to win the battle. What is your “Enterprise” and is it time to blow it up for something better – or maybe just a remodel/makeover? 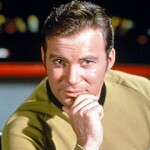 PLEASE LEAVE A COMMENT and let me know what Leadership Lessons from James T. Kirk we left out.